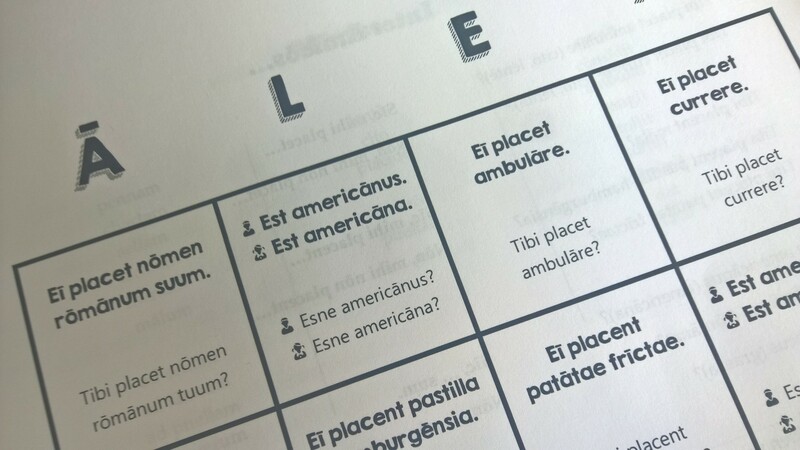 We had a great first week at this year’s Summer Language Institute in Latin! Spreading out the curriculum over two weeks has made the material even more fun and natural for students, and we’ve had so much more time to play processing games and build proficiency with productive language skills. 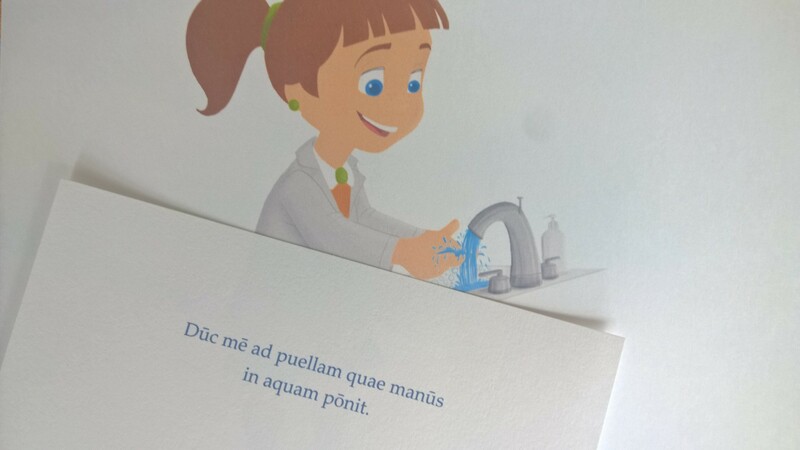 I knew the students were making great progress, but I was still impressed with their ability to retell stories, carry on conversations and communicate information through spoken Latin. Detectives was a new game for this year. First, I make a set of numbered wall images that are similar to story scenes but with one different detail in each scene (e.g. the boy throws an apple instead of a pen). Then I make a page of clue cards for each team. 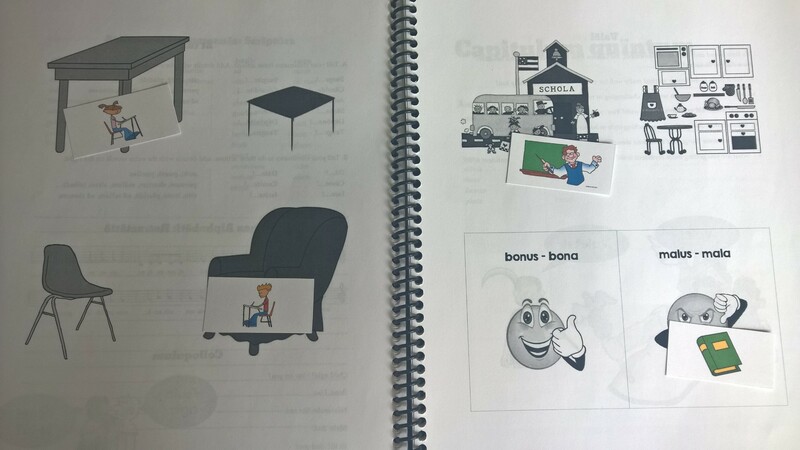 Each page has the same amount of clues cards as there are scenes, and the clues are similar to keyword statements from the original story and numbered so students know which scene to go look at; I print each page on colored paper so teams’ cards don’t get mixed up, and then I cut them out. The wall images are taped around the room, and the team clue cards are placed in piles up front. To play, I give each team their starting clue card. We have small classes at the SLI, so students are working in pairs. The students read the clue, go to the scene, and report back to me to tell me in the target language what was really happening in the scene. I give them their next card, and they continue to the next scene. Each team’s cards are randomized so there aren’t too many people at one particular scene at a time. In a larger class, where students can’t all go to scenes together, I would have teams send me one student to be the detective; that student can report back to their team (who write down the corrected information) and report the information and then report back to me to report and get a new card; the new card goes to another student in the group who’s the new detective for the team. Fact or Crap and Two Truths and a Lie were new games as well. 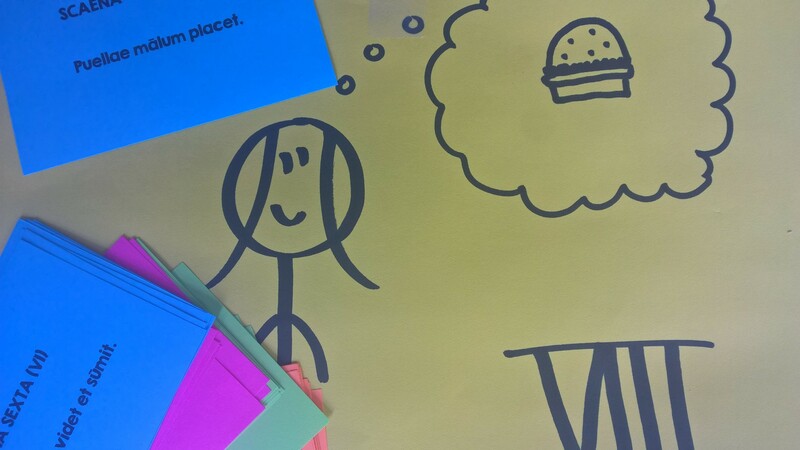 In Fact or Crap, one student does an action while another student describes what he or she is doing (telling either factual information or nonsense); the rest of the students yell out “fact” or “crap” in the target language. Two Truths and a Lie is a similar game, but a little more challenging. This time, the first two students have to give true information about the actor and the third has to tell a lie about the actor; students can give information related not only to the action but also to the actors themselves (appearance, name, nationality, etc.). Auditions is a basically a novel story acted out, with several students all acting at the same time. In our small group, I had all the students act out each scene. In a larger class, I would call on 3–4 students or ask for volunteers for each scene. Students’ goal is to get the role by being the best actor in the group.